Big, punchy sound in a highly portable, lightweight 4x10". The Neo series speaker cabinets from Acoustic are the perfect complement to the company' Class D heads; Neodymium speakers provide up to 40% lighter weight than Acoustic' traditional magnet speakers, all while providing that legendary Acoustic œPro' tone. These cabs offer superior power handling to match up perfectly with its Class D heads, and rugged construction touches, including plywood construction and spring-loaded handles make these cabs road-worthy. Easy-to-transport, lightweight, legendary tone can now be yours with the Neo Series bass cabinets from Acoustic! 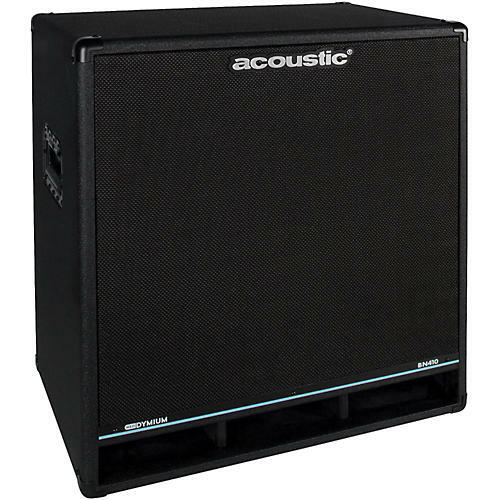 This BN40, 800W 4x10" is full of low-end punch to fill any gaps in your band's sound, or rattle the fillings out of your audience. The Class D Neo series of bass amps from Acoustic continue the legacy of œthe pro' tone, while providing extremely light weight and portability, combined with its signature tone-shaping controls. These high-powered heads, combos and speaker cabinets provide incredible sound clarity and control for small, medium or large live venues, studios and more.The series consists of three heads (300W, 600W and 1,000W), four speaker cabinets (4x10, 2X10, 1X15 and compact 1X12), and three combos, utilizing the power plants from the 300 & 600 heads (600W 2X10, 300W 1X15 and 300W compact 1X12). Dimensions: 24 in. x 16.1 in. x 27 in.